For the Indiana Pacers' owner, see Herbert Simon (real estate). Herbert Alexander Simon (June 15, 1916 – February 9, 2001) was an American economist, political scientist and cognitive psychologist, whose primary research interest was decision-making within organizations and is best known for the theories of "bounded rationality" and "satisficing". He received the Nobel Prize in Economics in 1978 and the Turing Award in 1975. His research was noted for its interdisciplinary nature and spanned across the fields of cognitive science, computer science, public administration, management, and political science. He was at Carnegie Mellon University for most of his career, from 1949 to 2001. Notably, Simon was among the pioneers of several modern-day scientific domains such as artificial intelligence, information processing, decision-making, problem-solving, organization theory, and complex systems. He was among the earliest to analyze the architecture of complexity and to propose a preferential attachment mechanism to explain power law distributions. Herbert Alexander Simon was born in Milwaukee, Wisconsin, on June 15, 1916. His father, Arthur Simon (1881–1948), was a Jewish electrical engineer who had come to the United States from Germany in 1903 after earning his engineering degree from the Technische Hochschule of Darmstadt. An inventor who was granted "several dozen patents", his father also was an independent patent attorney. His mother, Edna Marguerite Merkel, was an accomplished pianist whose ancestors had come from Prague and Cologne. His European ancestors had been piano makers, goldsmiths, and vintners. Simon's father was Jewish and his mother came from a family with Jewish, Lutheran, and Catholic backgrounds. Simon called himself an atheist. Simon was educated in the Milwaukee public school system, where he developed an interest in science. He found schoolwork to be interesting, but rather easy. Unlike many children, Simon was exposed to the idea that human behavior could be studied scientifically at a relatively young age due to the influence of his mother's younger brother, Harold Merkel, who had studied economics at the University of Wisconsin–Madison under John R. Commons. Through his uncle's books on economics and psychology, Simon discovered the social sciences. Among his earliest influences, Simon has cited Richard Ely's economics textbook, Norman Angell's The Great Illusion, and Henry George's Progress and Poverty. At that time, Simon argued "from conviction, rather than cussedness" in favor of George's controversial "single tax" on land rents. In 1933, Simon entered the University of Chicago, and following those early influences, he studied the social sciences and mathematics. He was interested in biology, but chose not to study it because of his "color-blindness and awkwardness in the laboratory". He chose instead to focus on political science and economics. His most important mentor was Henry Schultz, an econometrician and mathematical economist. Simon received both his B.A. (1936) and his Ph.D. (1943) in political science, from the University of Chicago, where he studied under Harold Lasswell, Nicolas Rashevsky, Rudolf Carnap, Henry Schultz, and Charles Edward Merriam. After enrolling in a course on "Measuring Municipal Governments", Simon was invited to be a research assistant for Clarence Ridley, with whom he coauthored Measuring Municipal Activities in 1938. Eventually his studies led him to the field of organizational decision-making, which would become the subject of his doctoral dissertation. After graduating with his undergraduate degree, Simon obtained a research assistantship in municipal administration which turned into a directorship at the University of California, Berkeley. From 1942 to 1949, Simon was a professor of political science and also served as department chairman at Illinois Institute of Technology in Chicago. There, he began participating in the seminars held by the staff of the Cowles Commission who at that time included Trygve Haavelmo, Jacob Marschak, and Tjalling Koopmans. He thus began an in-depth study of economics in the area of institutionalism. Marschak brought Simon in to assist in the study he was currently undertaking with Sam Schurr of the "prospective economic effects of atomic energy". From 1949 to 2001, Simon was a faculty at Carnegie Mellon. In 1949, Simon became a professor of administration and chairman of the Department of Industrial Management at Carnegie Tech (later to become Carnegie Mellon University). Simon later also taught psychology and computer science in the same university, (occasionally visiting other universities.). Simon married Dorothea Pye in 1938. Their marriage lasted 63 years until his death. In January 2001, Simon underwent surgery at UPMC Presbyterian to remove a cancerous tumor in his abdomen. Although the surgery was successful, Simon later succumbed to the complications that followed. They had three children, Katherine, Peter, and Barbara. His wife died in 2002. From 1950 to 1955, Simon studied mathematical economics and during this time, together with David Hawkins, discovered and proved the Hawkins–Simon theorem on the "conditions for the existence of positive solution vectors for input-output matrices". He also developed theorems on near-decomposability and aggregation. Having begun to apply these theorems to organizations, by 1954 Simon determined that the best way to study problem-solving was to simulate it with computer programs, which led to his interest in computer simulation of human cognition. Founded during the 1950s, he was among the first members of the Society for General Systems Research. Simon had a keen interest in the arts, as he was a pianist. He was a friend of Robert Lepper and Richard Rappaport. 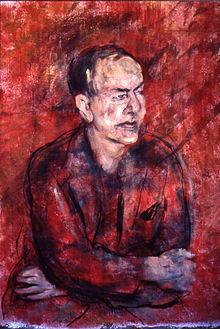 Rappaport also painted Simon's commissioned portrait at Carnegie Mellon University. He was also a keen mountain climber. As a testament to his wide interests, he at one point taught an undergraduate course on the French Revolution. Seeking to replace the highly simplified classical approach to economic modeling, Simon became best known for his theory of corporate decision in his book Administrative Behavior. In this book he based his concepts with an approach that recognized multiple factors that contribute to decision making. His organization and administration interest allowed him to not only serve three times as a university department chairman, but he also played a big part in the creation of the Economic Cooperation Administration in 1948; administrative team that administered aid to the Marshall Plan for the U.S. government, serving on President Lyndon Johnson's Science Advisory Committee, and also the National Academy of Science. Simon has made a great number of contributions to both economic analysis and applications. Because of this, his work can be found in a number of economic literary works, making contributions to areas such as mathematical economics including theorem, human rationality, behavioral study of firms, theory of casual ordering, and the analysis of the parameter identification problem in econometrics. Administrative Behavior, first published in 1947, and updated across the years was based on Simon's doctoral dissertation. It served as the foundation for his life's work. The centerpiece of this book is the behavioral and cognitive processes of humans making rational choices, that is, decisions. By his definition, an operational administrative decision should be correct and efficient, and it must be practical to implement with a set of coordinated means. Contrary to the "homo economicus" stereotype, Simon argued that alternatives and consequences may be partly known, and means and ends imperfectly differentiated, incompletely related, or poorly detailed. Any given individual or organization attempting to implement this model in a real situation would be unable to comply with the three requirements. Simon argued that knowledge of all alternatives, or all consequences that follow from each alternative is impossible in many realistic cases. The human being striving for rationality and restricted within the limits of his knowledge has developed some working procedures that partially overcome these difficulties. These procedures consist in assuming that he can isolate from the rest of the world a closed system containing a limited number of variables and a limited range of consequences. Simon therefore, describes work in terms of an economic framework, conditioned on human cognitive limitations: Economic man and Administrative man. Administrative Behavior addresses a wide range of human behaviors, cognitive abilities, management techniques, personnel policies, training goals and procedures, specialized roles, criteria for evaluation of accuracy and efficiency, and all of the ramifications of communication processes. Simon is particularly interested in how these factors influence the making of decisions, both directly and indirectly. Simons argued that the two outcomes of a choice require monitoring and that many members of the organization would be expected to focus on adequacy, but that administrative management must pay particular attention to the efficiency with which the desired result was obtained. Simon followed Chester Barnard who pointed out that "the decisions that an individual makes as a member of an organization are quite distinct from his personal decisions". Personal choices may be determined whether an individual joins a particular organization, and continue to be made in his or her extra–organizational private life. As a member of an organization, however, that individual makes decisions not in relationship to personal needs and results, but in an impersonal sense as part of the organizational intent, purpose, and effect. Organizational inducements, rewards, and sanctions are all designed to form, strengthen, and maintain this identification. Simon saw two universal elements of human social behavior as key to creating the possibility of organizational behavior in human individuals: Authority (addressed in Chapter VII—The Role of Authority) and in Loyalties and Identification (Addressed in Chapter X: Loyalties, and Organizational Identification). Authority is a well-studied, primary mark of organizational behavior, straightforwardly defined in the organizational context as the ability and right of an individual of higher rank to guide the decisions of an individual of lower rank. The actions, attitudes, and relationships of the dominant and subordinate individuals constitute components of role behavior that may vary widely in form, style, and content, but do not vary in the expectation of obedience by the one of superior status, and willingness to obey from the subordinate. Loyalty was defined by Simon as the "process whereby the individual substitutes organizational objectives (service objectives or conservation objectives) for his own aims as the value-indices which determine his organizational decisions". This entailed evaluating alternative choices in terms of their consequences for the group rather than only for onself or ones family. Decisions can be complex admixtures of facts and values. Information about facts, especially empirically-proven facts or facts derived from specialized experience, are more easily transmitted in the exercise of authority than are the expressions of values. Simon is primarily interested in seeking identification of the individual employee with the organizational goals and values. Following Lasswell, he states that "a person identifies himself with a group when, in making a decision, he evaluates the several alternatives of choice in terms of their consequences for the specified group". A person may identify himself with any number of social, geographic, economic, racial, religious, familial, educational, gender, political, and sports groups. Indeed, the number and variety are unlimited. The fundamental problem for organizations is to recognize that personal and group identifications may either facilitate or obstruct correct decision making for the organization. A specific organization has to determine deliberately, and specify in appropriate detail and clear language, its own goals, objectives, means, ends, and values. Simon has been critical of traditional economics' elementary understanding of decision-making, and argues it "is too quick to build an idealistic, unrealistic picture of the decision-making process and then prescribe on the basis of such unrealistic picture". His contributions to research in the area of administrative decision-making have become increasingly mainstream in the business community. Simon was a pioneer in the field of artificial intelligence, creating with Allen Newell the Logic Theory Machine (1956) and the General Problem Solver (GPS) (1957) programs. GPS may possibly be the first method developed for separating problem solving strategy from information about particular problems. Both programs were developed using the Information Processing Language (IPL) (1956) developed by Newell, Cliff Shaw, and Simon. Donald Knuth mentions the development of list processing in IPL, with the linked list originally called "NSS memory" for its inventors. In 1957, Simon predicted that computer chess would surpass human chess abilities within "ten years" when, in reality, that transition took about forty years. In the early 1960s psychologist Ulric Neisser asserted that while machines are capable of replicating "cold cognition" behaviors such as reasoning, planning, perceiving, and deciding, they would never be able to replicate "hot cognition" behaviors such as pain, pleasure, desire, and other emotions. Simon responded to Neisser's views in 1963 by writing a paper on emotional cognition, which he updated in 1967 and published in Psychological Review. Simon's work on emotional cognition was largely ignored by the artificial intelligence research community for several years, but subsequent work on emotions by Sloman and Picard helped refocus attention on Simon's paper and eventually, made it highly influential on the topic. Simon also collaborated with James G. March on several works in organization theory. With Allen Newell, Simon developed a theory for the simulation of human problem solving behavior using production rules. The study of human problem solving required new kinds of human measurements and, with Anders Ericsson, Simon developed the experimental technique of verbal protocol analysis. Simon was interested in the role of knowledge in expertise. He said that to become an expert on a topic required about ten years of experience and he and colleagues estimated that expertise was the result of learning roughly 50,000 chunks of information. A chess expert was said to have learned about 50,000 chunks or chess position patterns. He was awarded the ACM Turing Award, along with Allen Newell, in 1975. "In joint scientific efforts extending over twenty years, initially in collaboration with J. C. (Cliff) Shaw at the RAND Corporation, and subsequentially [sic] with numerous faculty and student colleagues at Carnegie Mellon University, they have made basic contributions to artificial intelligence, the psychology of human cognition, and list processing." Simon was interested in how humans learn and, with Edward Feigenbaum, he developed the EPAM (Elementary Perceiver and Memorizer) theory, one of the first theories of learning to be implemented as a computer program. EPAM was able to explain a large number of phenomena in the field of verbal learning. Later versions of the model were applied to concept formation and the acquisition of expertise. With Fernand Gobet, he has expanded the EPAM theory into the CHREST computational model. The theory explains how simple chunks of information form the building blocks of schemata, which are more complex structures. CHREST has been used predominantly, to simulate aspects of chess expertise. Simon has been credited for revolutionary changes in microeconomics. He is responsible for the concept of organizational decision-making as it is known today. He also was the first to discuss this concept in terms of uncertainty; i.e., it is impossible to have perfect and complete information at any given time to make a decision. While this notion was not entirely new, Simon is best known for its origination. It was in this area that he was awarded the Nobel Prize in 1978. At the Cowles Commission, Simon's main goal was to link economic theory to mathematics and statistics. His main contributions were to the fields of general equilibrium and econometrics. He was greatly influenced by the marginalist debate that began in the 1930s. The popular work of the time argued that it was not apparent empirically that entrepreneurs needed to follow the marginalist principles of profit-maximization/cost-minimization in running organizations. The argument went on to note that profit maximization was not accomplished, in part, because of the lack of complete information. In decision-making, Simon believed that agents face uncertainty about the future and costs in acquiring information in the present. These factors limit the extent to which agents may make a fully rational decision, thus they possess only "bounded rationality" and must make decisions by "satisficing", or choosing that which might not be optimal, but which will make them happy enough. Bounded rationality is a central theme in behavioral economics. It is concerned with the ways in which the actual decision making process influences decision. Theories of bounded rationality relax one or more assumptions of standard expected utility theory. Further, Simon emphasized that psychologists invoke a "procedural" definition of rationality, whereas economists employ a "substantive" definition. Gustavos Barros argued that the procedural rationality concept does not have a significant presence in the economics field and has never had nearly as much weight as the concept of bounded rationality. However, in an earlier article, Bhargava (1997) noted the importance of Simon's arguments and emphasized that there are several applications of the "procedural" definition of rationality in econometric analyses of data on health. In particular, economists should employ "auxiliary assumptions" that reflect the knowledge in the relevant biomedical fields, and guide the specification of econometric models for health outcomes. Simon determined that the best way to study these areas was through computer simulations. As such, he developed an interest in computer science. Simon's main interests in computer science were in artificial intelligence, human–computer interaction, principles of the organization of humans and machines as information processing systems, the use of computers to study (by modeling) philosophical problems of the nature of intelligence and of epistemology, and the social implications of computer technology. In his youth, Simon took an interest in land economics and Georgism, an idea known at the time as "single tax". The system is meant to redistribute unearned economic rent to the public and improve land use. In 1979, Simon still maintained these ideas and argued that land value tax should replace taxes on wages. Some of Simon's economic research was directed toward understanding technological change in general and the information processing revolution in particular. [The] criticism of practice (called "drill and kill," as if this phrase constituted empirical evaluation) is prominent in constructivist writings. Nothing flies more in the face of the last 20 years of research than the assertion that practice is bad. All evidence, from the laboratory and from extensive case studies of professionals, indicates that real competence only comes with extensive practice... In denying the critical role of practice one is denying children the very thing they need to achieve real competence. The instructional task is not to "kill" motivation by demanding drill, but to find tasks that provide practice while at the same time sustaining interest. He received many top-level honors in life, including becoming a fellow of the American Academy of Arts and Sciences in 1959; election to the National Academy of Sciences in 1967; APA Award for Distinguished Scientific Contributions to Psychology (1969); the ACM's Turing Award for making "basic contributions to artificial intelligence, the psychology of human cognition, and list processing" (1975); the Nobel Memorial Prize in Economics "for his pioneering research into the decision-making process within economic organizations" (1978); the National Medal of Science (1986); the APA's Award for Outstanding Lifetime Contributions to Psychology (1993); ACM fellow (1994); and IJCAI Award for Research Excellence (1995). Honorary doctorate, Lund School of Economics and Management, 1968. Honorary degree, University of Pavia, 1988. Honorary Doctor of Laws (LL.D.) degree from Harvard University in 1990. Honorary degree, University of Buenos Aires, 1999. Simon was a prolific writer and authored 27 books and almost a thousand papers. As of 2016, Simon was the most cited person in artificial intelligence and cognitive psychology on Google Scholar. With almost a thousand highly cited publications, he was one of the most influential social scientists of the twentieth century. 1947. Administrative Behavior: A Study of Decision-Making Processes in Administrative Organization. 1969. The Sciences of the Artificial. MIT Press, Cambridge, Mass, 1st edition. Made the idea easy to grasp: "objects (real or symbolic) in the environment of the decision-maker influence choice as much as the intrinsic information-processing capabilities of the decision-maker"; Explained "the principles of modeling complex systems, particularly the human information-processing system that we call the mind." - 2nd ed. in 1981, MIT Press. As stated in the Preface, the second edition provided the author an opportunity "to amend and expand [his] thesis and to apply it to several additional fields" beyond organization theory, economics, management science, and psychology that were covered in the previous edition. - 3rd ed. in 1996, MIT Press. 1982. Models of Bounded Rationality, Vols. 1 and 2. MIT Press. His papers on economics. - Vol. 3. in 1997, MIT Press. His papers on economics since the publication of Vols. 1 and 2 in 1982. The papers grouped under the category "The Structure of Complex Systems"– dealing with issues such as causal ordering, decomposability, aggregation of variables, model abstraction– are of general interest in systems modelling, not just in economics. 1956. "Reply: Surrogates for Uncertain Decision Problems", Office of Naval Research, January 1956. – Reprinted in 1982, In: H.A. Simon, Models of Bounded Rationality, Volume 1, Economic Analysis and Public Policy, Cambridge, Mass., MIT Press, 235–44. ^ a b "Dorothea Simon Obituary - Pittsburgh, PA - Post-Gazette.com". Post-Gazette.com. Retrieved 8 August 2015. ^ a b Herbert Simon, "Autobiography", in Nobel Lectures, Economics 1969–1980, Editor Assar Lindbeck, World Scientific Publishing Co., Singapore, 1992. ^ "Herbert Alexander Simon". AI Genealogy Project. Archived from the original on 2012-04-30. Retrieved 2012-03-15. ^ a b "Guru: Herbert Simon". The Economist. 20 March 2009. Retrieved 13 February 2018. ^ a b Edward Feigenbaum (2001). "Herbert A. Simon, 1916-2001". Science. 291 (5511): 2107. doi:10.1126/science.1060171. Studies and models of decision-making are the themes that unify most of Simon's contributions. ^ Simon, Herbert A. (1978). Assar Lindbeck, ed. Nobel Lectures, Economics 1969–1980. Singapore: World Scientific Publishing Co. Retrieved 22 May 2012. ^ Simon, H. A., 1955, Biometrika 42, 425. ^ Herbert A. Simon: The Bounds of Reason in Modern America by Hunter Crowther-Heyck, (JHU 2005), page 25. ^ Hunter Crowther-Heyck (2005). Herbert A. Simon: The Bounds of Reason in Modern America. JHU Press. p. 22. ISBN 9780801880254. His secular, scientific values came well before he was old enough to make such calculating career decisions. For example, while still in middle school, Simon wrote a letter to the editor of the Milwaukee Journal defending the civil liberties of atheists, and by high school he was "certain" that he was "religiously an atheist", a conviction that never wavered. ^ a b Velupillai, Kumaraswamy. Computable Economics: The Arne Ryde Memorial Lectures. New York: Oxford University Press, 2000. ^ a b c d "Herbert A. Simon – Biographical". nobelprize.org. Retrieved 2016-12-01. ^ "Home - Carnegie Mellon University Libraries". Retrieved 8 August 2015. ^ William J. Baumol (1979). "On The Contributions of Herbert A. Simon to Economics". The Scandinavian Journal of Economics. 81 (1): 655. doi:10.2307/3439459. JSTOR 343945. ^ a b C. Barnard and H. A. Simon. (1947). Administrative Behavior: A Study of Decision-making Processes in Administrative Organization. Macmillan, New York. ^ Herbert A. Simon, A Theory of Emotional Behavior. Carnegie Mellon University Complex Information Processing (CIP) Working Paper #55, June 1, 1963. ^ Herbert A. Simon, "Motivational and Emotional Controls of Cognition". Psychological Review, 1967, Vol. 74, No. 1, 29-39. ^ "Herbert A. Simon - A.M. Turing Award Winner". Retrieved 8 August 2015. ^ Feigenbaum, E. A.; Simon, H. A. (1984). "EPAM-like models of recognition and learning". Cognitive Science. 8 (4): 305–336. doi:10.1016/s0364-0213(84)80005-1. ^ Gobet, F.; Simon, H. A. (2000). "Five seconds or sixty? Presentation time in expert memory". Cognitive Science. 24 (4): 651–682. doi:10.1016/s0364-0213(00)00031-8. ^ "Press Release: Studies of Decision-Making Lead to Prize in Economics". Nobelprize.org. 16 October 1978. Retrieved 11 May 2014. ^ Barros, Gustavo (2010). "Herbert A. Simon and the Concept of Rationality: Boundaries and Procedures" (PDF). Brazilian Journal of Political Economy. 30 (3): 455–472. doi:10.1590/S0101-31572010000300006. ^ Simon, Herbert. "Letter to the Pittsburgh City Council", December 13, 1979. Archived in the Herbert A. Simon Collected Papers, Carnegie Mellon University Library. Quote: "It is clearly preferable to impose the additional cost on land by increasing the land tax, rather than to increase the wage tax"
^ a b "John Mighton: The Ubiquitous Bell Curve", in Big Ideas on TVOntario, broadcast 1:30 a.m., 6 November 2010. ^ National Academy of Sciences. Nas.nasonline.org. Retrieved on 2013-09-23. ^ "Honorary doctors at Lund School og Economics and Management". Lund University. Retrieved 4 September 2014. ^ "Publicaciones, Facultad de Ciencias Económicas, Universidad de Buenos Aires, Boletín Informativo". Universidad de Buenos Aires, Facultad de Ciencias Económicas. Retrieved 6 June 2015. ^ Newell, A.; Shaw, J. C.; Simon, H. A. (1958). "Elements of a Theory of Human Problem Solving". Psychological Review. 65 (3): 151–166. doi:10.1037/h0048495. Augier, Mie; March, James (2001). "Remembering Herbert A. Simon (1916-2001)". Public Administration Review. 61 (4): 396–402. doi:10.1111/0033-3352.00043. JSTOR 977501. Bhargava, Alok (1997). "Editor's introduction: Analysis of data on health". Journal of Econometrics. 77: 1–4. doi:10.1016/s0304-4076(96)01803-9. Courtois, P.J., 1977. Decomposability: queueing and computer system applications. New York: Academic Press. Courtois was influenced by the work of Simon and Albert Ando on hierarchical nearly-decomposable systems in economic modelling as a criterion for computer systems design, and in this book he presents the mathematical theory of these nearly-decomposable systems in more detail than Simon and Ando do in their original papers. Frantz, R., and Marsh, L. (Eds.) (2016). Minds, Models and Milieux: Commemorating the Centennial of the Birth of Herbert Simon. Palgrave Macmillan. Herbert Alexander Simon at the AI Genealogy Project. — (12 December 1962). "The Architecture of Complexity" (PDF). American Philosophical Society. 106 (6): 467–482. JSTOR 985254. Archived from the original (PDF) on 10 March 2009. Retrieved 23 February 2010.